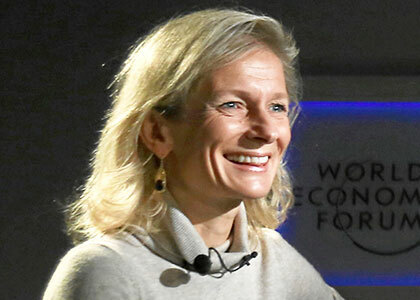 Zanny Minton Beddoes is the Editor-in-Chief of The Economist, appointed in February 2015. She was formerly Business Affairs Editor overseeing the paper’s business, finance, economics, science and technology coverage. From 2007 to 2014, Ms Minton Beddoes was Economics Editor, based in Washington, DC, where she led the paper’s global economics coverage. She has written special reports on the world economy, Germany, Latin American finance, global finance and Central Asia. Ms Minton Beddoes joined The Economist in 1994 after spending two years as an economist at the International Monetary Fund (IMF). Previously, she worked as an adviser to the Minister of Finance in Poland, as part of a small group headed by Professor Jeffrey Sachs of Harvard University. Ms Minton Beddoes is a frequent television and radio commentator on both sides of the Atlantic, including on the “Bill Maher Show” (HBO), “Fareed Zakaria GPS” (CNN), “Newsnight” (BBC), “Newshour” (PBS), CNBC and “Public Interest” (NPR).